In just over one year, between August 1942 and October 1943, approximarely 60,000 Allied prisoners of war and 200,000 Asians were forced by the Japanese to construct a 415 km railway connecting Non Pladuk, Thailand and Thanbyuzayat, Burma. Workers suffered from a lack of adequate food, new clothing or other materials for living, tools to effectively complete such heavy work and medicine to cure such illnesses as beriberi, malaria, tropical ulcers,ringworm and cholera. Because of all this and the arduous and relentless labour which was expected of them, it is estimated that about 90,000 people, in other words one in five Allied prisoners and two in five Asian labourers, died. Albert Moreton, an English soldier, who was captured in February 1942 in Singapore, somehow survived three and a half years as a prisoner of war of the Japanese and as a worker along this so-called Death Railway. During this time, despite the danger of being caught and severely punished for the possession of such, he secretly kept a diary and drew various sketches which form the majority of this book. 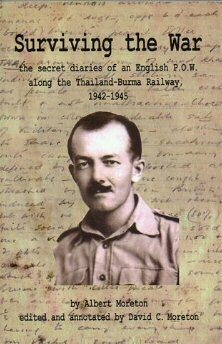 His story is an important addition to the limited amount of similar works written during World War II about life as a POW on the Thailand-Burma Railway.